Finally, a Windows 7 tablet with 3G in it! 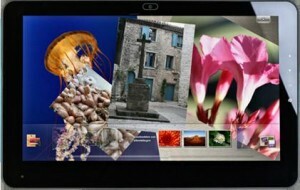 Netherlands based Ambiance Technology has launched a AT-Tablet which is the first 3G Windows 7 powered tablet PC in the market. The company in a press release today said that the 10 inch AT Tablet was the first 3G tablet to run Windows 7 Home Premium. With the 3G connectivity, you can surf the web and check email and just about anything that you would do on a home PC. The AT-Tablet comes with a 10 inch multi touch display, 1 GB RAM, 1.3 mega-pixel web cam and microphone, a 160GB hard drive, USB ports, a SD card reader, LAN connectivity, Blue-tooth and a VGA connector for external display. LG Windows 7 Tablet Spotted!